1 drawing : watercolour on paper ; 14.8 x 26 cm [image]. Titled in pencil on verso: First examination of boys by Rev. T. Hodson in Rajah's Palace. While in Mysore Hodson managed the Rajah of Mysore's Free School which opened in October 1840. 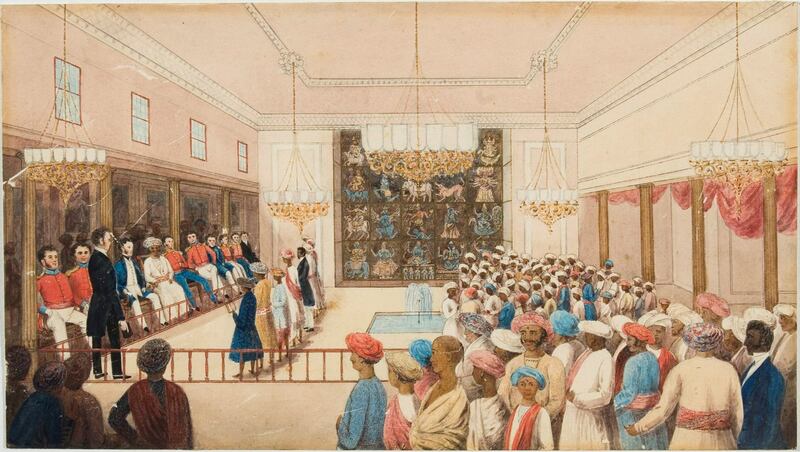 An examination of the pupils was held at the Rajah's palace on 7 October 1841, as reported in the Missionary Register for 1842: "About 12 o'clock, the First Class was called into a most magnificent room, where the Rajah and several European officers were seated. The boys commenced by reading the Testament in English...."
The Methodist Church, Overseas Division (Methodist Missionary Society); Christie's (London) Topographical Pictures 16 July 1993, lot 206; Caroline Simpson Collection, Clyde Bank, The Rocks, Sydney, 1996-2004. You may save or print this image for research and study. If you wish to use it for any other purposes, you must contact Sydney Living Museums to request permission.